I should probably begin this review with the obvious: “Fanthom” is a terrible product name. As uni-ball’s erasable pen, I understand that it’s meant to be a play on the word “phantom,” but as far as purposeful misspellings go, it’s pretty bad. On the other hand, the same criticism might be made of Pilot’s erasable pen, the Frixion, but it never mattered in that case because that Frixion works incredibly well. 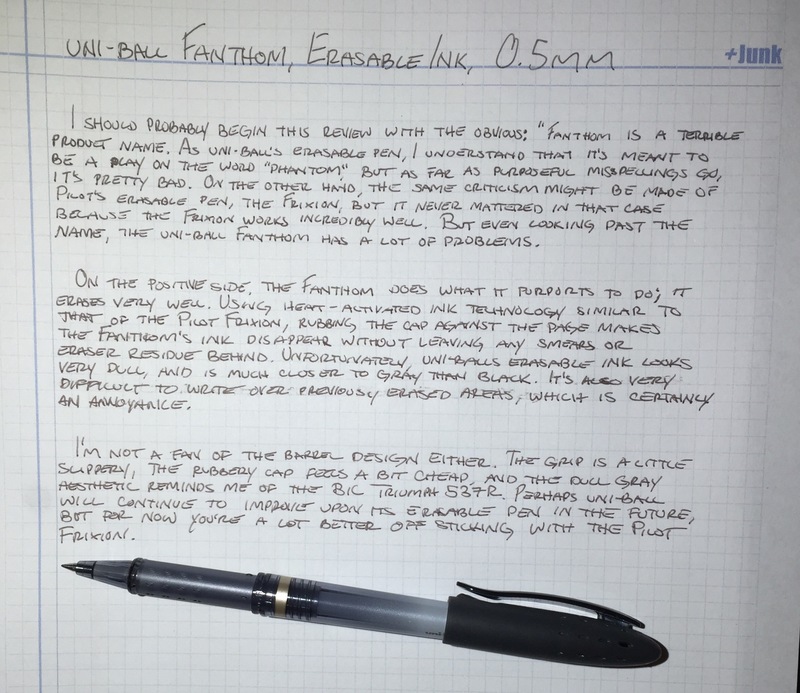 But even looking past the name, the uni-ball Fanthom has a lot of problems. On the positive side, the Fanthom does what it purports to do; it erases very well. 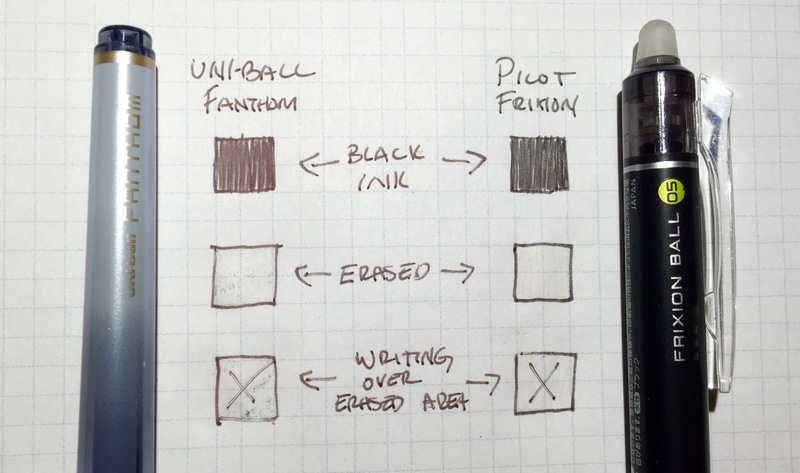 Using heat-activated ink technology similar to that of the Pilot Frixion, rubbing the the cap against the page makes the Fanthom’s ink disappear without leaving any smears or eraser residue behind. Unfortunately, uni-ball’s erasable ink looks very dull and is much closer to gray than black. It’s also difficult to re-write over previously erased areas, which is certainly an annoyance. I’m not a fan of the barrel design either. The grip area is a little slippery, the rubbery cap feels a bit cheap, and the dull gray aesthetic reminds me of the BIC Triumph 537R. Perhaps uni-ball will improve upon its erasable pen in the future, but for now you’re a lot better off sticking with the Pilot Frixion. Well Appointed Desk has a nice post reviewing the Fanthom and Frixion pens. Lots of pictures. She saw some residue from the eraser of the Fanthom, which looks more like residue from the erased ink to my eye. A review from Pen Addict. He also had trouble re-writing over previously erased areas. The Frixion has this issue too (see above picture), but not nearly to the same extent.